Introduction: Isolated right pulmonary artery agenesis in an adult patient is an extremely rare condition that requires a high level of suspicion to make the diagnosis. 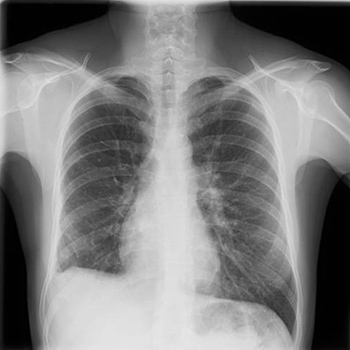 Case Description: A 32-year-old woman presented to the emergency room with a 4-month history of recurrent respiratory infections. Chest radiography and computerized tomography (CT) revealed alveolar opacities on the medium and inferior right lobes. Fibreoptic bronchoscopy with bronchial aspirate was negative on both cytological and microbiological analysis. Due to the persistent of the imaging findings after a full course of a wide-spectrum antibiotic, an angio-CT was performed, revealing a complete stop at the level of the right pulmonary artery. Angiography confirmed the diagnosis of right pulmonary artery agenesis. Discussion: Currently, the patient has no exertional dyspnoea, screening for pulmonary hypertension has so far been negative and no further respiratory infections have occurred. It is important to call attention to a major congenital malformation that may remain asymptomatic until adulthood. Bockeria LA, Makhachev OA, Khiriev T, et al. Congenital isolated unilateral absence of pulmonary artery and variants of collateral blood supply of the ipsilateral lung. Interact Cardiovasc Thorac Surg 2011;2:509–510. Bouros D, Pare P, Panagou P, et al. The varied manifestation of pulmonary artery agenesis in adulthood. Chest 1995;108:670–676. Kruzliak P, Syamasundar RP, Novak M, et al. Unilateral absence of pulmonary artery: pathophysiology, symptoms, diagnosis and current treatment. Arch Cardiovasc Dis 2013;106:448–454. Ten Harkel AD, Blom NA, Ottenkamp J. Isolated unilateral absence of a pulmonary artery: a case report and review of the literature. Chest 2002;122:1471–1477.